Recently, I've been reading an ebook by Sarah Mae about housekeeping and the "why" behind it. It's not like me to read an ebook, but with late night feedings and my handy dandy iPad, it's become much more appealing lately. One piece of advice that the book suggests is to pick those most important items that you want to accomplish tomorrow and list them out today. The author suggests six items for each day, and whatever doesn't get accomplished gets pushed to the top of the list tomorrow. You're supposed to do the tasks in order, and not move on until an item is actually entirely complete. I thought this would be a great idea. I imagined this including items such as "Clean out the refrigerator" or "Make a set of freezer meals" or "Reorganize all the closets". However... Adding a baby changes things quickly. I'm glad for the idea of the list. It has helped me to remember that my time is limited. It's a reminder that, painful or not, I need to realize that I will not accomplish everything I want to do today. The small size of the list- just six items!- is very humbling, especially because of what my list looks like these days, and how seldom I accomplish all six items. However discouraging it might be to realize I can't do everything, it's also freeing. I won't do all that I want to do today. I can't do those things and be a good, attentive mommy. I can't practice flexibility or be available to feed a growth-spurting baby if I'm going to get all my mind's projects done. It's freeing to realize that, while I cannot do everything, planning ahead allows me to make the best possible decision, and then to own it. Clean bathroom top to bottom. ASAP. Plan out my menu and shopping list for this week's out-of-town guest. Vacuum. Big Brother A's helicopters and beans are taking over. Write out letters to Big Brother A and Baby S documenting their development, preferences, and milestones. Include pictures. Toddlers have an amazing ability to value every little thing. Unfortunately, they often feel the need to value them inside the house. Some of these list items are very frequently on my mind. It would feel so good to get them done. I would love to have a visitor-ready house all the time, especially since foster care means people dropping in at a moment's notice - people who actually are judging for some basic level of cleanliness and put-together-ness in my home. Read my Bible. Preferably while children are relatively calm and/or sleeping. Drink water. Don't get a dehydration headache (again) today. Shower, even if it can't be till 4 pm. Eat meals. Don't just feed children. Spend individual time with each child. Smile. Talk about God. First of all, obviously, I'm not there yet with the linear priorities thing. I think of these items more as windows of time, and I'll pick one of them based on my best approximation of the window I might have for accomplishing something at the given moment. I want to be in a place where the second (realistic) list is "the stuff I get done before starting my list for the day". But that is not where I am. I am two weeks into figuring out life as a family of four- again. Infants are demanding. Toddlers are - wow - demanding is not even the word for it. 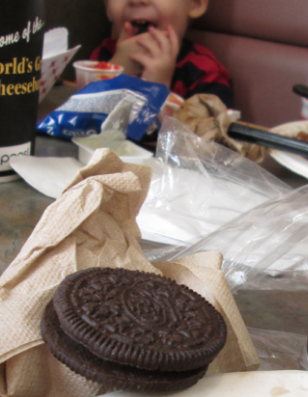 But just when you're about to give up, they share one of their two beloved Oreos with you just because they love you. My life is so full of joy. But I will forget the good things if I keep thinking I'm going to achieve all of my preferred list in one day. So, today, I showered. I was seriously really proud of myself for being clean and dressed (with my teeth brushed!!) by 10 am. I read the Bible - to Big Brother A, at least. I actually ate lunch with a baby in a front carrier, rocking the whole time, so he wouldn't wake up and remember how sad he is today. The laundry is in progress. I started it at 7:30 am, so technically it's taken me longer than this before to get through a load. (Well, assuming I get back downstairs before Josh gets home.) And I have spent time with each child. That one is really important to me as they are both adjusting to our changing family. All this just to say- I need the list, if only to remember that my time needs to be prioritized, and that I need to be realistic. Those other cleaning items really do need to get done. But right now, my family is in full-swing grace mode. We'll make it, and we'll fall into a rhythm eventually. While we're figuring it out, though, I'm going to continue to assess every moment based on my top priorities; make sure to take care of my own needs in order to be ready to pour out sacrificially into those around me; and try to wear my joy and my love for my family on my face, rather than the stress that tries to take over. I want my family to think that I love serving them, because I do. I want them to think that they are worth sacrificing my ideal image of my home, because they are. And I want those toughest moments to be the ones where I wear my joy most obviously, because those are the moments I know that God is growing and stretching me to be closer to the Woman of God that I long to be.